Thesis: Wavy line under thesis. Is it the main idea of the essay? Does it encompass all of the claims? Does it provide the direction for the essay? 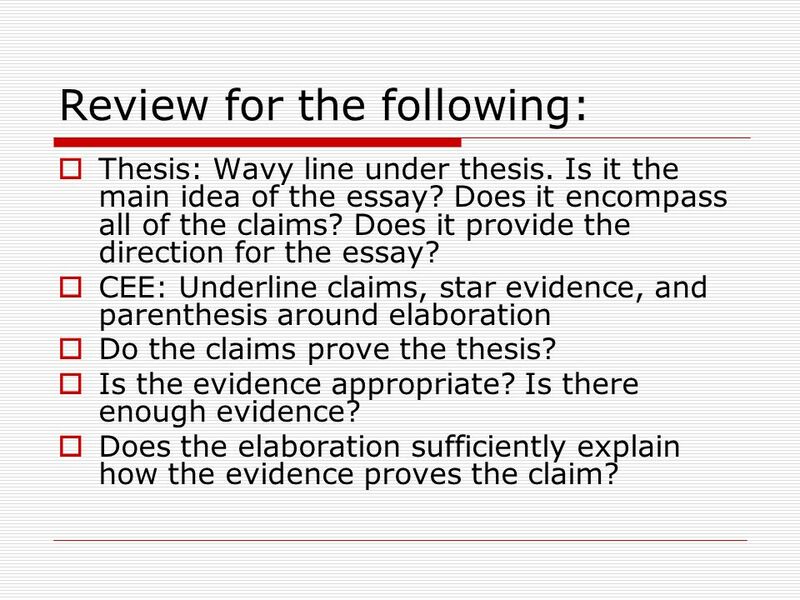 CEE: Underline claims, star evidence, and parenthesis around elaboration Do the claims prove the thesis? Is the evidence appropriate? Is there enough evidence? Does the elaboration sufficiently explain how the evidence proves the claim? Quote integration: Are there “hit-and-run” quotes? Are quotes introduced with context? Does the author try to embed quotes? Introduction: Are title and author introduced? Is title properly punctuated? Does the intro hook the reader in? 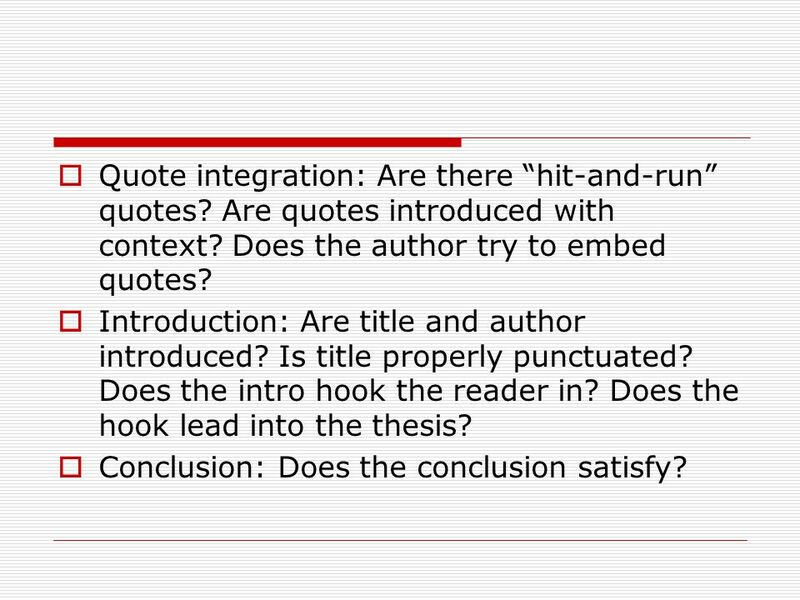 Does the hook lead into the thesis? Conclusion: Does the conclusion satisfy? Remember that we are not editing! Look at content and organization. Ask questions of one another. 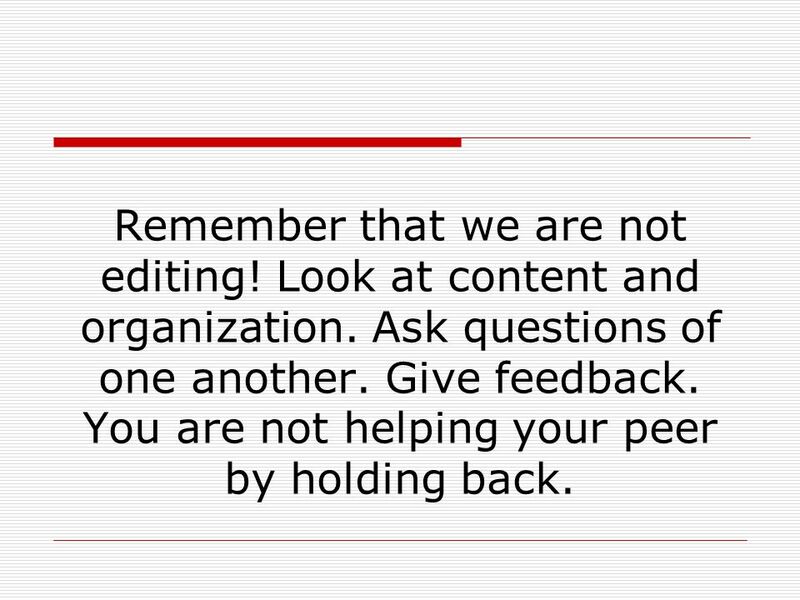 Give feedback. You are not helping your peer by holding back. 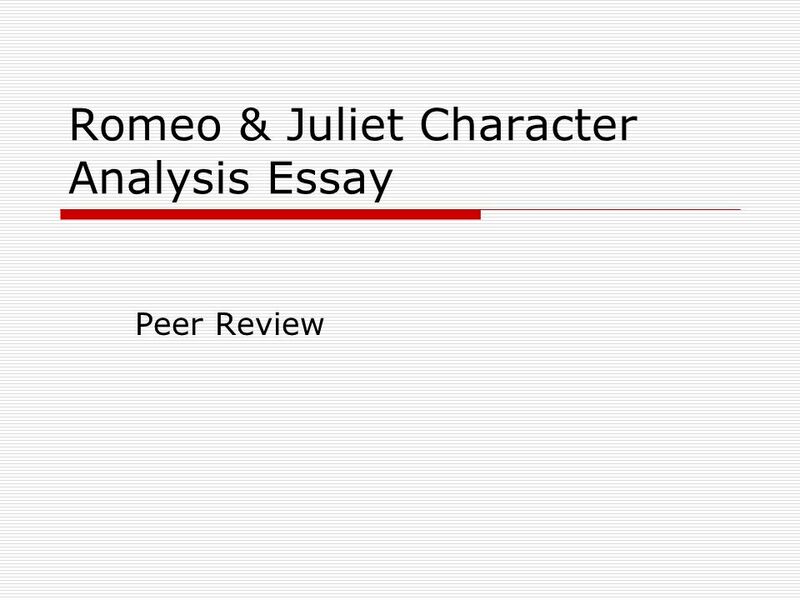 Download ppt "Romeo & Juliet Character Analysis Essay"
How to Write a Timed Essay Mrs. Johnson Accelerated English. Self editing The Bean Trees. Format 1. double spaced? pt font? 3 paragraphs indented? 4. Title? (think of one that works for essay) 5. Name and. Peer Editing Poe Analysis Papers. Partners Everyone needs to get a partner and sit in a comfortable place with that partner. Everyone needs colored pencils. Romeo and Juliet Who is to blame for the tragedy and unhappiness? Critical Essay Writing Some advice…. Introduction Body paragraph/main idea 1 Body paragraph/main idea 3 Body paragraph/main idea 2 Conclusion. Accelerated 10 English 1. Read 2. Details 3. Topic – Significant to the Text 4. Return to the details. o Details are combined/interpreted to determine. WHAT EVERY 9 TH GRADER NEEDS TO KNOW! 9 th Writing Survival Guide. Suggestions For Writing An Essay Hour Glass Style. Objective After completing notes on the basic parts of a an academic essay, and evaluating sample THESIS statements students will be able to: – Create. Welcome! Warm up  What has been the most challenging part about writing your essay on language?  What has been the least challenging part of. Self editing The Bean Trees. Format 1. double spaced? 2. 12 pt font? 3 paragraphs indented? 4. Title? (think of one that works for essay) 5. Name and.